Finland’s economic rate of growth will slow down clearly this year and remain modest also next year. According to our forecast, GDP will grow by 1.4 per cent this year and 1.2 per cent next year. GDP is expected to grow by 1.2 per cent also in 2021. In 2020 and 2021, Finland’s economic growth will be slightly below potential output growth. The weakening of economic growth is mainly due to the slowdown in global economic growth. Decelerating economic growth will be highly dependent on private consumption growth starting next year. The greatest risks are related to the expansion of the trade war and political uncertainty in the US and Europe in general. Finnish exports will grow by 2.7 per cent this year and by 2.4 per cent next year. This year export growth will be boosted by deliveries of large ships. Private consumption will grow 1.4 per cent this year and 1.3 per cent next year. The rise in earnings and the increase in employment will bolster the purchasing power of households. The household savings rate will slowly improve over the forecast period. Investment growth will slow down this year as among other things housing growth comes to a halt. Investments are projected to grow at a rate of around one per cent this and next year. The unemployment rate is expected to fall sharply this year. This is mainly due to the excellent development of the labour market at the end of last year. The current year’s unemployment rate is forecast to be 6.7 per cent. Next year employment is projected to increase only slightly, so the unemployment rate will remain at 6.7 per cent. 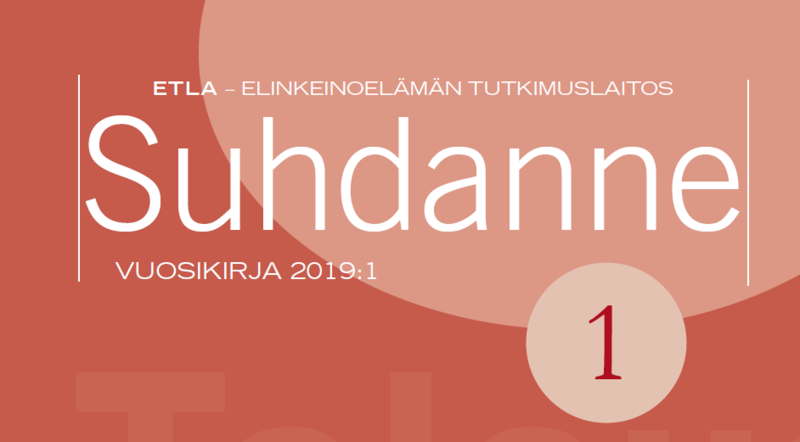 Finnish consumer prices will rise 1.2 per cent this year, 1.4 per cent in 2020 and 1.6 per cent in 2021. The general government’s financial position will improve this year and the deficit is projected to be 0.6 per cent of GDP. Next year, the fiscal balance will continue to improve, but public finances will remain in deficit: a deficit of 0.4 per cent of GDP is projected. The boom in the global economy has subsided. Growth is slowing down in the euro area, China and the United States. The US economy is expected to continue expanding at a fairly modest rate this year, with growth expected to be 2.2 per cent. Next year, the US economy is forecast to grow by just 1.6 per cent. The slowdown in growth is a consequence of the simultaneous deterioration of the international business cycle, increased protectionism and the tapering off of the effects of President Trump’s fiscal stimulus. GDP in the EU area is projected to grow by 1.1 per cent this year and 1.4 per cent in 2020 and 2021. The GDP forecast for the current year has been revised downwards by 0.7 percentage points from last September’s forecast, as the GDP growth of key EU countries such as Germany and Italy in the second half of last year was disappointing and the outlook has remained weak. Germany’s export-driven economy is sensitive to global economic turmoil, while Italy’s problems are more home-grown. Britain in turn suffers from the uncertainty caused by the chaotic Brexit process. In the event of a no-deal Brexit, the growth in the UK and the euro area will slow down more than in our baseline forecast. The Russian economy is predicted to grow steadily at 1.5 per cent this and next year – that is, near the rate of potential production growth in the country with current structures. China’s GDP growth is forecast to be 6 per cent this year, but next year it will be only 5.8 per cent. This year global output is expected to grow by 3.1 per cent, i.e. 0.5 percentage points slower than last year. World economic growth is expected to slow down further by next year, with 3.0 per cent growth forecast for 2020. The risks of poorer development are significant. Although the time limit for trade negotiations has just been extended beyond the first of March, the trade war between the US and China is still in danger of escalating. In addition, the trade war between the United States and the EU may also be rekindled. The United States has currently imposed customs duties on goods imported from China totalling USD 250 billion, while China has imposed countervailing duties on US imports amounting to USD 110 billion. The US, on the other hand, imposed aluminium and steel tariffs on the EU in June, to which the EU responded by imposing duties on selected US consumer products. The development of the global economy is also overshadowed by the potential impact of more widespread political risks. The British government has progressed in the Brexit negotiations with a risky strategy – if it can be called a strategy – that threatens to lead the country to a chaotic and economically damaging no-deal withdrawal from the EU. The Italian government openly disputed the budgetary impact of its budget deficit with the European Commission, while the country’s 10-year government bond yields climbed to a level peaking at 3.6-3.7 per cent. In the end, the European Commission approved the Italian budget, which is blatantly contradictory to the deficit rules of EU countries. The French government was also hit by a populist movement entailing large-scale protests by yellow-vest demonstrators. In the end, French President Marcon was forced to make concessions to the yellow vests, as a result of which France also violates the key deficit rules of EU countries. Euro area GDP growth has slowed down from the 0.4 per cent growth rate prevailing in the first half of last year in comparison to previous quarters. Growth subsided to 0.2 per cent in the second half of last year compared to previous quarters. The slowdown in the region’s economic growth was a result of decelerating economic growth especially in Germany and Italy: according to preliminary figures, Germany only narrowly avoided a recession at the end of last year, while Italy was technically deemed to be in a recession. We predict that euro area GDP will grow 1.1 per cent this year and 1.3 per cent next year. Growth will accelerate by one tenth of a percentage point in 2021, when it is predicted to be 1.4 per cent. All euro economies are forecast to grow, but there are differences in growth rates. This year’s growth is expected to remain good in Spain and the Netherlands, at around 2 per cent. The German economy is growing at a rate of 1.0 per cent and the French economy at a slightly faster pace. Many export-dependent euro-area countries are sensitive to global trade disruptions such as tariff hikes. The mere uncertainty about future tariffs will dampen business investment. This year, however, the euro area will receive a boost from the easing of fiscal policy, particularly in Germany, the Netherlands, France and Italy. For the time being, monetary policy in the euro area remains relatively loose, but it began to be tightened early this year when net purchases of securities were discontinued. Monetary policy would be tightened even more if the so-called TLTRO financing operations designed to promote bank lending are not continued this year. We nevertheless predict that the program will be continued at least in part. The ECB is not anticipated to raise the key interest rates from zero until the beginning of 2021, as inflation in the euro area will remain below the central bank’s target (slightly below 2 per cent) this year and next. The euro area is also still vulnerable to bank risk. In Italy and a few other countries, mainly in southern Europe, there are banks whose solvency remains weak. This argues in favour of introducing reforms regarding the euro area financial markets and banking sector, in particular the formation of the banking union. According to preliminary data of the National Accounts, Finland’s GDP grew by 2.2 per cent last year. Exports grew sluggishly, by 1.4 per cent. Imports simultaneously grew by 4.3 per cent so net exports contributed negatively to economic growth by as much as one percentage point. According to preliminary data, private consumption increased by 1.4 per cent. The strong growth in real purchasing power boosted private consumption and spurred a rise in household savings rates. Investment increased by 3.3 per cent. The change in inventories increased GDP growth by up to 1.3 percentage points last year, which is unusually high. Finland’s total output is forecast to grow by 1.4 per cent this year. The growth rate has thus fallen by 0.8 percentage points since last September. From a structural perspective, however, the growth forecast has remained largely unchanged. We expect net exports to foster growth this year. Starting next year, growth will be driven primarily by private consumption. In 2020, the growth in exports is forecast to be just over 2 per cent, while imports will grow at an almost equal pace. Investment will increase by about 1 per cent both this year and next year. Next year, Finland’s total output growth is forecast to slow down to 1.2 per cent. Similarly, in 2021, we expect Finnish GDP growth to be 1.2 per cent, which is close but still slightly below potential output growth. The production gap is expected to be distinctly more negative next year. In 2019, export volumes are projected to grow by 2.7 per cent. Exports of goods will increase by 2.6 per cent and services exports by 3.0 per cent. This year, the growth of goods exports is supported by large ship deliveries: two major cruise ships will be delivered this year. Motor vehicle exports continue to grow at a positive pace due to the production of the Uusikaupunki car factory. The increase in oil refining is also expected to be visible in exports this year. Germany is still clearly the most important destination for Finnish goods exports. In comparison to last year’s average, the euro’s dollar exchange rate becomes weaker in our forecast, which also contributes to export growth. Next year, export volumes are projected to grow by 2.4 per cent, i.e. slightly more slowly than this year. Exports of services are forecast to continue to grow faster than exports of goods. In 2021, exports are expected to continue to grow at a rate of 2.4 per cent. Continuing export success requires that the rise in real earnings does not significantly exceed productivity growth rates in 2020 and 2021. This year’s wage negotiation round, where the Finnish wage model will be put to the test, will play a crucial role in this respect. Investment is expected to grow by 1.1 per cent this year. Growth is reduced by the decline in residential construction and public investment – zero growth is predicted in residential construction this year. In contrast, investment in machinery and equipment and R&D is expected to pick up slightly this year. In 2020, investment growth will decelerate slightly, to 1.0 per cent. Residential construction growth is forecast to remain close to zero. Machinery and equipment investment will continue to grow, but their growth will also slow down. Other construction growth is also expected to be only slightly positive. There will be no significant changes in the investment rate during this and next year. Last year’s employment growth was much faster than expected. Employment growth was particularly strong during the summer months and the latter half of last year. At the same time, the unemployment rate also dropped significantly. The number of employed persons is forecast to grow by 31,000 this year from last year. In practice, this will be achieved if seasonally adjusted employment does not fall from its present level. As the supply of labour is expected to grow only slightly this year, the unemployment rate is projected to fall to 6.7 per cent. At the same time, the employment rate is forecast to rise to an average of 72.6 per cent. Thus, the 72 per cent employment rate target of the current government will be surpassed by a wide margin. The government’s target of 110,000 new jobs will also be realized clearly (employment is expected to increase by some 135,000 persons during the government’s term). Next year, employment growth is forecast to continue at a much slower pace. The unemployment rate is no longer expected to fall, as it will remain at 6.7 per cent. The employment rate is nevertheless expected to improve somewhat next year, to 72.8 per cent, as employment for 15-64 year olds is growing faster than their number. The availability of skilled labour will somewhat limit the growth of employment this and next year. The growth of real earnings and other income in addition to employment will boost consumption this and next year. Private consumption is forecast to grow by 1.4 per cent this year and 1.3 per cent also next year. At the same time, the savings rate of households and non-profit institutions serving households is slowly improving. In 2021, private consumption is still forecast to grow by 1.3 per cent, which is only slightly slower than the growth of real purchasing power. In the future, in addition to employment development, the development of private consumption will hinge upon how wage increases are formed in the next round of wage negotiations, starting this year. In our forecast, earnings will increase by 2.2 per cent this year and 2.8 per cent next year. Next year’s earnings will nevertheless be boosted by the end of temporary holiday pay cuts by the public sector. Consumer prices are forecast to rise 1.2 per cent this year. Inflation will accelerate this year, especially owing to the rise of housing, food and non-alcoholic beverage prices. Next year, consumer price increases are projected to accelerate to 1.4 per cent, with housing and food prices rising the most. In 2021, consumer prices will increase by 1.6 per cent in our forecast. Rising interest rates will spur an acceleration of inflation in 2021. Public finances are gradually consolidating during our forecast period. The public sector deficit is forecast to be 0.9 per cent of GDP. The decision-based fiscal policy is expected to be slightly tighter this and next year. The current year’s public sector budget deficit is projected to be 0.6 per cent of GDP while next year’s deficit will be 0.4 per cent of GDP. According to our forecast, the public sector will remain in deficit until 2023: sluggish economic growth will not be enough to raise public finances into a surplus. The so-called public sector EDP debt will fall to 59.3 per cent this year. Next year’s public sector EDP debt is projected to be 59.0 per cent and 58.6 per cent in 2021. In our baseline forecast, the public sector EDP debt will fall to 57.4 per cent of GDP by 2023. The central government’s budget balance will improve steadily over the next few years, but it will remain clearly negative in our forecast until 2023. The surplus of social security funds will decrease from 1.3 per cent last year to 0.8 per cent of GDP by 2023. Although the public debt-to-GDP ratio will decline over the forecast period, its development is nevertheless clearly weaker than we predicted last autumn. The actual development is very sensitive, however, to changes in the value of GDP. The economic policy of the next government and reforms designed to boost employment rates will also be of pivotal importance. Finland clearly fulfils the 3 per cent target for the public sector deficit. The public sector’s structural financial position is estimated to have been around -0.8 per cent of total output in 2018, after which it improved slightly to -0.5 per cent in 2019. In 2020 the structural financial position is estimated to be close to being in balance. It is nevertheless possible that the improved structural financial position of 2020 reflects an over-estimation of the potential of the economy and that the assessment of the structural financial position will be revised downwards. As a result of the phenomena mentioned above, Finland’s total output will be slightly below its potential level this year and next, which means that the output gap will be negative in both years. However, estimates of potential output are known to be sensitive to the assumptions made and methods used.